Hey ladies! I know I haven’t posted in a while, ahh so sorry! Mom life is a little harder than I anticipated. My little guy is almost 11 months old now (yikes) time fly’s. So now I just post when I can, in my spare time. Posting about things I come a cross during my life as a mom and right now I have an obsession with baby bibs! Mason is a drool king and I have made it my mission to find some of the best bibs that contain the drool. So here are a few of my go to bibs. I absolutely love bibs from Ollie & Tate, I came a cross Cait and Laura’s shop on Etsy. They have a great selection of patterns! I own 5 different patterns and love them all, they are made out of 100% Organic Cotton, and have an absorbent layer of French Terry on reverse side, they come with one snap. The only thing that I would change about these bibs is adding another snap so that baby doesn’t grow out of them to quickly. Stains in my experience remove well. I once left a spaghetti stained bib in the hamper for a day without treating it and it came out the next day! I was super impressed. These bibs are pretty good at containing the drool, however I have had to change them on super drooly days. I have found that Mason gets them quite wet from teething. I find that the french terry backing isn’t as absorbent as fleece or minky. But still adore them! Another shop that I had recently come a cross on Etsy was BareBabies, I was very impressed with Karen’s shop from fast shipping, to great prices, to the personalized note that she includes with her orders! That is one of the things I love about Etsy shop owners! they really make the experience a nice one. I chose the Bears ‘n’ Teepees Bandana bib, she has many more patterns to chose from. This one in particular is super cute, and great quality. Holds up well against stains if you treat right away. 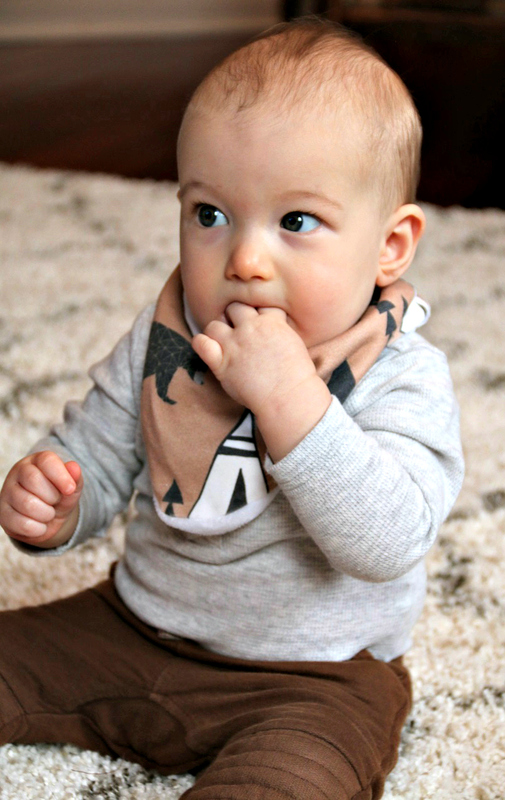 This bib is made from 100% Organic Cotton with a Minky fabric backing. Her bibs come with 2 snaps which I love so Mason won’t grow out of it to quickly. The minky backing holds up very well on the most drooly of days. Also the minky backing is super soft so I would imagine it feels nice around babies neck. I have found that with the minky backing there hasn’t been a need to change his bib unless he gets it soaked from spilling milk. 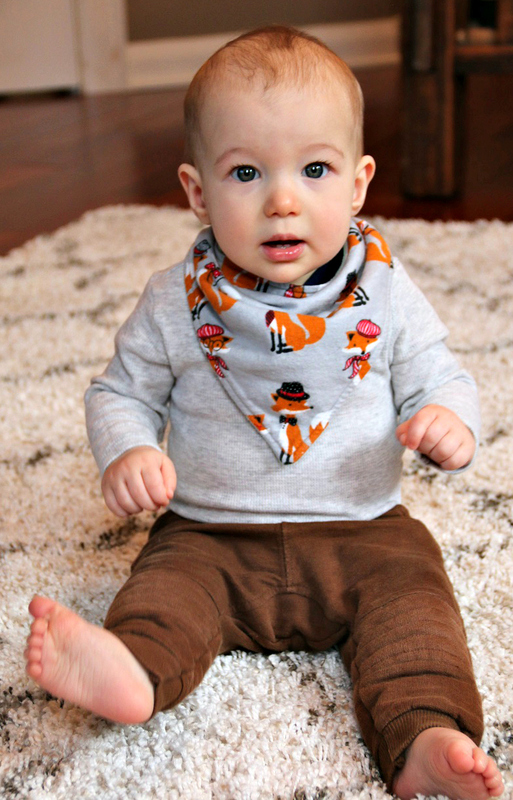 This bandana bib is from Matimati Baby. I found this company through a friends recommendation. They come in a pack of 4. All packs are theme related. For the price of $24.75 I was like wow what a great deal. But the shipping to Canada is awful, so if you live in the states it’s a way better savings. But besides the shipping cost these bibs are pretty good, I find them on the thinner side, but still get the job done. They are made from 100% Organic Cotton and have a polyester fleece backing, which is soft and very absorbent. The one thing I find with these bibs is they stain, and they stain quite easily, even if you act fast and treat right away they still unfortunately stain in my experience. They also come with 2 snaps so they can be easily adjusted as your baby grows, which is a definite plus! Rating the drool factor, they hold up pretty nicely. On very drooly days I have had to change the odd one. But comparing the thickness of the bib to the others, I would have thought I would have had to change they more frequently, but was mistaken, so yay Matimati for making a bib that is light but effective. 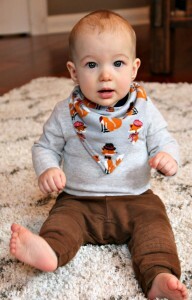 Lastly, this bandana bib is from Quaint, this bib was also recommended by a friend. 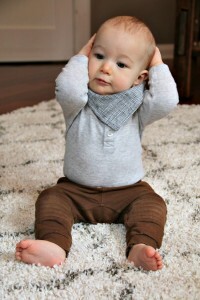 Bibs by Quaint are playful, fun and reversible. They have a good selection of patterns to chose from. These bandana bibs cover a large portion of your babies body so it definitely saves babies clothes from getting soaked on the drooliest of days! These bibs also come with 2 snaps so they can grow with baby and the backing is made with fleece, which helps absorb drool better to keep baby nice and dry! I find mason has to spill something on it to soak all the way through. Since the bib covers a large portion of his body it catches drool well, and the fleece backing helps baby stay nice and dry. This entry was posted in BABY and tagged baby bibs, bandana bibs, bibs, etsy, etsy bibs. 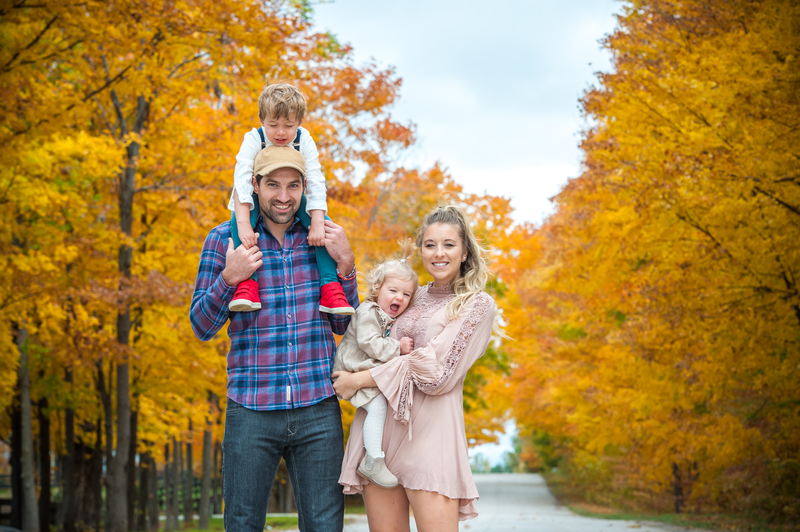 ← Baby Moccasins, are they worth it?